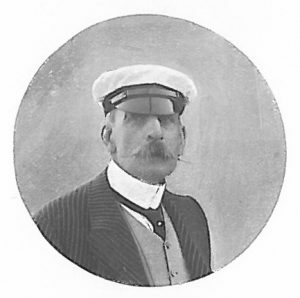 Is a member of the Royal Yacht Squadron. He has had over thirty-five years’ experience of yachts and yachting, both sail and steam. In 1870 he owned Moonbeam, an 18-ton cutter, which he used for racing and cruising purposes. He then purchased the schooner yacht Kala Fish, de­signed by Dr. Collis Brown, with a ram bow and shallow draft, and this her owner chiefly used for exploration and visits to the dead cities of the Zuyder Zee and the shallow harbours of the Dutch and Scandinavian coasts. 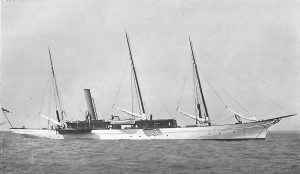 In 1877 he built his first steam yacht Isa, and it was in this yacht that the first set of triple expansion engines was installed. They were built by Douglas and Grant of Kirkcaldy upon suggestions made by Mr. Andrews and his con­sulting engineer, Mr. A. Taylor. The boiler pressure was 120 pounds, and the Isa proved herself eminently successful from the engine point of view. She was afterwards sold to Mr. Chadwick Healy, and is still in existence, belonging at present to the Earl of Cork. The Taurus, 330 tons, was then purchased, and after long cruises to the Baltic and Scandinavian coasts she was sold to Mr. A. Wilkinson, who renamed her Lady of Clennell, and she is still in existence. He then pur­chased Taurus II., 546 tons, which he sub­sequently sold to Lord Crawford, who re­named her Consuelo. It was this yacht which the present King of Italy, then Prince of Naples, chartered from Mr. Andrews for a cruise to Spitzbergen. At Advent Bay, in that far-off Arctic region, a little monument was erected to commemorate the event, and bears the yacht’s name, and over it is the burgee of the Royal Yacht Squadron. Mr. Andrews subsequently purchased from Baron A. de Rothschild the steam yacht Eros, 770 tons, which he renamed Taurus III., and of which he is still the owner. Isa. S. Y., 247 tons. Earl of Cork and Orrery. Taurus, S. Y., 770 tons. Dr. Hugh Andrews, D. L.